FCA recalls Chrysler, Dodge and Jeep models to replace the catalytic converters. 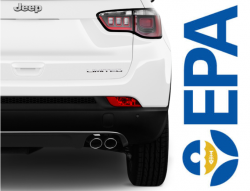 March 13, 2019 — An FCA emissions recall has been announced by the Environmental Protection Agency (EPA) for 863,000 Chrysler, Dodge and Jeep vehicles in the U.S.
Fiat Chrysler says the emissions recall follows investigations conducted by the automaker and the EPA that shows the vehicles don't meet federal environmental regulations. Chrysler says the vehicles are front-wheel-drive and three models are equipped with continuously variable transmissions (CVTs). FCA says they discovered the problems during routine emissions testing and reported the issues to the EPA which opened an investigation. According to environmental regulators, more emissions recalls may be ordered as the agency continues to investigate additional FCA models. Every vehicle will need a new catalytic converter and it's likely the vehicle won't pass inspection until the new converter is installed. The emissions recall will be broken into phases spread throughout 2019, giving FCA time to supply dealerships with nearly 900,000 catalytic converters. Customers will need to wait for official word from Fiat Chrysler, but the EPA says older models will be the first to be repaired. Model year 2011 vehicles are scheduled to be recalled by the end of March 2019 and model year 2012 FCA vehicles will be recalled during the second quarter of 2019. Owners of model year 2013-2014 vehicles will have their vehicles repaired during the third quarter of 2019 and from October to December 2019 model year 2015-2016 vehicles will be recalled. FCA owners can continue to drive their vehicles and the automaker says there are no safety risks, but concerned customers may call Chrysler at 800-853-1403.